Abdelkader Damani studied Architecture in Oran, Algeria, and Art History and Philosophy in Lyon, France. Since 2007, he is the Head of the « Veduta » Platform at the Biennale de Lyon. This year he will be one of the three guest curators of the 11th Biennale of Dakar, Senegal, in charge of the selection of North African artists. For ASEF culture360, he talks about the programmes he initiated in the frame of the Biennale de Lyon and shares his views on the importance of the local context and the creativity required to involve local people in the development of artistic projects. If you had to pick up one word that captures Lyon, what would it be? I think I would choose landscape. Indeed, a landscape can be defined as a coherent area that contains several surprises and curiosities that make it remarkable. Lyon is a beautiful and calm landscape full of surprises. I mean that this is a city that, when it deals with culture, holds its inhabitants in suspense in a journey where they can discover every form of creation : Lumière Film Festival, the two Biennales de Lyon (contemporary art and dance), Quai du Polar (crime fiction festival), Assises du Roman (international forum on the novel), Nuits Sonores (electronic and indie music festival), Nuits de Fourvière (performing arts festival) etc. When the activity is getting calmer, you just have to walk along the rivers : the Soâne with, literally, kilometers of art with the « Rives de Saône » art programme, or the Rhône, with its renovated banks offering a delightful way to live and enjoy this city. Over the past twenty-five years, there was a blossoming of contemporary art biennales around the world. What makes the Biennale de Lyon unique? To really get what makes the Biennale de Lyon specific, one must consider the paradigms that give a peculiar dimension to a biennale: its artistic structure and the relation it has with its territory. The Biennale de Lyon is firmly anchored in art history. « This is first of all a project held by a museum » keeps explaining its artistic director, Thierry Raspail. There is indeed a structural connection between the Biennale and the macLYON (contemporary art museum of the city). The artistic director of the Biennale is also the director of this museum. After being the co-curator of the three first editions (in 1991, 1993 and 1995), he since then proposes to guest curators to build a reflection based on a word that, according to him, synthesizes the artistic actuality of the moment. Every word is proposed for three editions and forms the frame of a six years trilogy. « Global » (in 1997, 2000 and 2001) « Temporality » (in 2003, 2005 and 2007) and « Transmission » (in 2009, 2011 and 2013) were proposed for past editions. « Modern » opens a new trilogy with Ralph Rugoff as general curator for the first edition using that word in 2015. The international exhibition is handled by a guest curator. This part is the heart of the project and sticks to the expectation people have in general for a biennale : an exhibition of contemporary artists. « Résonance » is a platform which offers the possibility to local structures and actors of the Rhône-Alpes Région (one of the largest of the French regions, spanning from the centre of France to the Swiss and Italian borders, Lyon is its capital) to get more visible, with more than one hundred participants during each edition (art centres, cultural structures, libraries and so on). At last, « Veduta », that I am responsible for, deals both with local and global, with the creation of art and its reception, with what is made in the inner city and beyond its limits, with professional work and amateur practice. The combination of this three platforms in one event gives, in my opinion, all its specific dimension to the Biennale de Lyon. This aspect allows us to think that the Biennale de Lyon makes an accurate definition of this new neologism born with the emergence of biennales : « glocal ». You work as the Artistic Director of « Veduta », one of the main side-project of the Biennale de Lyon. Could you explain what is its main objective? « Veduta » is above all a team work and a permanent dialogue held with the guest curator and the international exhibition. It is also characterized by the participation of several towns scattered through the Lyon metropolis. Our goal is to set the Biennale to the whole scale of its home territory and foster the meeting of all kinds of public. The first principle of « Veduta » is the artistic experience considered as an equation with four criteria : the work of art, space, the viewer and the discourse. In our project, there is no hierarchy of any kind between this four components of artistic experience. The fact that you can combine them without end in different orders offers the opportunity to imagine every possible form of interaction with art. For instance, which kind of shape can take an art exhibition in a place like a laundromat ? In 2013, this reflection gave birth to « Cycle délicat » (« Delicate Cycle »), an exhibition and performance of 35 minutes held in a laundromat in Lyon. In 2009, we used places like a public swimming pool (« Animaux–animaux » / « Animals-animals » exhibition) or a police station (« Très portraits » exhibition). You can vary the four factors, or even omit some of them, in order to picture a « brand new » form to experiment the way we encounter artworks. Our second principle is to involve non professionals in the implementation and conception of the curatorial project of « Veduta ». The amateur is undoubtedly the main character, the « hero » of this part of the Biennale. Since 2009, we try to elaborate participatory forms in which every person, regardless of their level of study and how deep is their knowledge, can make sense out of art works and create something meaningful. 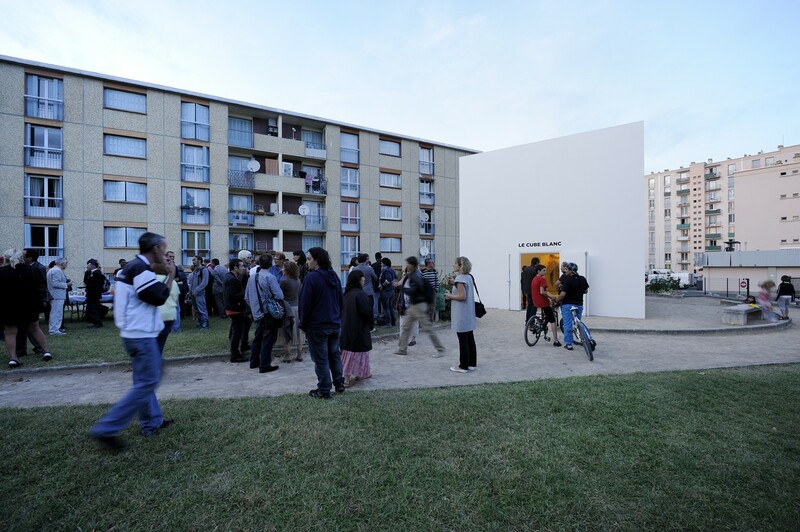 The most significant example to illustrate this is the « Cube Blanc » (« White Cube ») organised in 2011 in a town in the east suburbs of Lyon. Conceived as a temporary museum, it is directed by non professional exhibition curators and programmers. This group has made two exhibitions, one using the permanent collections of the macLYON and the second dedicated to French artist Christian Lhopital, invited in the international exhibition of the Biennale that year. In 2013, the amateur has been put right in the heart of « Veduta ». With the « Chez Moi » (« At Home ») project, we asked all the artists participating in the international exhibition to propose one of their work in order to exhibit it in a private context, within the home of Lyon’s inhabitants. 62 private flats thus welcomed 62 artworks from these artists during the whole duration of the Biennale. This resulted in the coexistence of two shows : a public one, the international exhibition presented in its traditional places, and another one, completely private, showcased in flats and houses. The third principle is to use artists concepts and their works as a curatorial process. Each work of art is considered, in our point of view, like an action enclosed inside a form. The aim of « Veduta » is to pull out the action in order to literally put it into effects on the city, making no difference between public or private space. We try to give a tangible or material dimension to the concepts, utopias and statements of artists. Let me give you two examples taken from our last edition in 2013 : « Enquête sur une disparition » (« Investigation on a disappearance ») and the « Poïpoïgrotte » (interpretation of « Le ou la Poïpoïdrome à Espace-Temps Réel, Prototype 00, 1963-1975 », by Robert Filliou and Joachim Pfeufer). « Enquête sur une disparition » is a project based on a work by Claudio Parmiggiani. In 1989, this Italian artist created a sculpture made of a big mud sphere, that was supposed to disappear from public view at the end of the exhibition, being buried in the cloister of the Palais Saint-Pierre in Lyon (right in the centre of the city, this building is now home of the Lyon Fine Arts museum). The macLYON accepted the fate choosen by the artist for its work and decided to buy it. The only thing that remains of this today is the souvenir of the work, some kind of oral memory that must relate this moment. Within the frame of « Veduta », we formed a group of amateur persons with the task to investigate on this story, identifying witnesses of the burial, of this whole quite strange story, and to get their version of it. This process led to the making of an exhibition on this story where collected testimonies are presented. The « Poïpoïgrotte » originates from an inivitation made to French collective Bruit du Frigo. The question we asked them was : what does « permanent creation », a concept imagined by French artist Robert Filliou, would be if you had to use it in real life ? The answer of the artists is a come-back to the very first place that brought together the two acts of living and creating for humans : a cave. They built a structure striking for its curious architecture and used it as an urban shelter. Anyone could come to spend one day and sleep in the premises with the authorization to draw and write on the walls until all the surfaces were filled up. Most of the events organized in the framework of « Veduta » take place in unconventional places. Could you tell us what are the main challenges when using alternative spaces ? I think the question of the place is fundamental. In a white cube (whether this is a museum or an art center) you can control space as you like, you can adapt it to the art work. When you are out of it, it’s all the opposite, you have to adapt yourself. So, what are the challenges ? The first one is to find every time the right answer in order for the artistic experience that I mentioned earlier to happen and embrace all the players. It can for instance take the form of an invitation of a group of artists like Elshopo, when we decided in 2009 to imagine an artistic performance made in a food market. Another example is to conceive the right exhibition for a public space like a swimming pool or a police station. You have to make all the protagonists involved at their best, otherwise you are bound to fail. Consider this : how can you convince policemen to welcome a contemporary art exhibition, swimming instructors to participate in a perfomance, or simple citizens to whisper an art story in someone else’s ear ? These are our challenges : convince people that the diffusion and sharing of the experience of art is something useful and valuable. This is also a way for us to question our methods in the conception and curating of exhibitions. There are some fragments of space and time that got my attention and that I would like to test in the future, like a bus stop, or where you wait for traffic lights to turn to red before crossing the street… These are some examples of small spaces where people remains only for a very short time. If you want to work on this, you have no other choice than change entirely how you present and work on contemporary art. What sort of impact has this programme had on local communities and what kind of reactions did you receive? For those who don’t regularly visit museums or contemporary art exhibitions, in other words, for most people out there, this is definitely the discovery of a new world. But it’s much harder to say what remains of all this. What is sure is that we succeeded with « Veduta » to carry out what we call « L’Ecole de l’Amateur » (« the Amateur School »), long term projects lasting from 6 up to 10 months we have made with some groups of people whose concerns and preoccupations were really miles away from contemporary art. Thanks to them, we have information on the impact of our projects. For example, the group forming the curatorial and cultural mediation team of the « Cube Blanc » in 2011 gathered into an association. This group is since then organising new exhibitions inviting artists. Another circle of amateurs followed the same path in 2013 after their collaboration with French artist Jean-François Gavoty. They participated in another artist residency programme and today they organise visits and tours of contemporary art exhibitions. But you can’t realise this without a serious work in advance, before and during the Biennale. How do you envision the future development of the « Veduta » programme ? Do you think similar initiatives could be organised in an another urban context? I always tell my team that we will complete our mission the day when we will not be needed anymore, when people will dare to approach works of art in a simple, direct and spontaneous way, free from fetishism or any sacred dimension. The day when urban public space will be full of contemporary art. The day when museums storerooms will be empty because we will have identified and found all those who accept to keep the pieces. Can you imagine a contemporary art museum launching a public call, asking for average citizens to hold and shelter its artworks, making its storage empty and setting up an exhibition of all his collections scattered in private homes ? Of course, I know this idea sounds quite provocative and controversial, especially if you consider the preservation of heritage. Yet, history itself proves that if you want any kind of heritage to continue to exist, you have to move into it, to keep it and make it alive. This is the perfect definition of a rehabilitation, that you can consider by the way as an assignment given to the places. Why should it be different with contemporary artworks ? Maybe the future of this heritage relies on the fact that we should live with it and in it. To do so, one should facilitate all the loan procedures of artworks. We need to move towards the end of this idol worship and fetishism that characterizes our relation with contemporary art. This is really something I am totally convinced of. Can something like « Veduta » be made in another context ? My answer is yes. The formula is easy : always try to experiment, have among your partners museums and collections that accept to go in the same direction and territories (official representatives, technicians and inhabitants) willing to participate and have cross-disciplinary teams. The question of the team is of upmost importance. Veduta mediators are more considered like « situations creators ». When they go from door to door to meet the average citizen to propose « 5 minutes of contemporary art », the number of years you have spent in university is not enough anymore, your creativity, passion, involment and the capacity you have to set harmonious relations with others are much more important. Florent Petit is former project officer in the cultural unit of the French Embassy in Japan. He holds a Master’s degree in Art History from the Sorbonne University in Paris and in International Relations from the Institute of Political Studies of Lyon. Former lecturer of Chinese, Korean and Japanese art in the Ecole du Louvre in Paris, he has occupied several curatorial positions in museums in France (Asian Unit of the Musée du quai Branly, Paris) and Luxembourg (Mudam, Museum of contemporary art, Luxembourg City).